America's favorite workplace cartoon Dilbert has branched out. Scott Adams, creator of the cartoon strip, told CBS News Entertainment Correspondent Mark McEwen that not only does he have a new book out in time for the holidays, but the Dilbert.com is getting 1.5 million unique hits every month. Adams receives hundreds of ideas each day from fans eager to share their stories of absurd work situations and unbelievable bosses. Adams spends a lot of time on the Web site because he's especially excited about his new link, The Lazy Entrepreneur. "It's an off-shoot of the Dilbert.com Web site for people who think they have a million-dollar idea  which is just about everybody  but they're too lazy to do anything about it themselves," said Adams. "So they'd rather suggest the idea, put it on the Web site and let somebody else create the project so they can just buy it." One of the recent ideas that Adams likes is "a stuffed buzzard that you can clamp to the top of a cubicle wall for people who have announced their retirement or perhaps they're not working up to their potential." Another idea is a virtual bumper sticker on the back of your car that can be changed with your mood. Adams said there was a real human being who is the prototype for Dilbert. "To this day he does not know he is the real Dilbert." Adams grew up in the Catskill mountains of New York. He studied economics at Hartwick College in Oneonta, N.Y. and received an MBA from the University of California at Berkley. He originally got his material for his comic strip from his former day job as an applications engineer at Pacific Bell and "humiliating and low-paying jobs involving technology and finances." "I noticed that many of my co-workers had eerily similar, potato-shaped bodies," says Adams. He started making sketches of them and eventually came up with Dilbert. In 1987 Dilbert made his debut as a winning entry in a "People Who Look Like Their Dog" contest in the San Francisco Chronicle. Since then, Dilbert has been on the covers of many national magazines, including Newsweek, People, TV Guide and Life. Dilbert is reportedly the most photocopied, pinned up, downloaded, faxed and e-mailed comic strip in the world. It's also the fastest growing comic strip in newspapers, appearing in more than 2,000 papers in 57 countries. 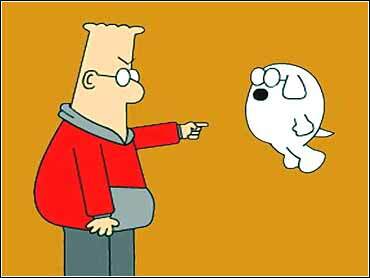 Part of Dilbert's appeal is his dog, Dogbert, who anticipates ruling the world, since he believes people are too stupid to stop him. The San Francisco Examiner dubbed Dilbert "the cartoon hero of the workplace" and The Wall Street Journal praised Adams' talent for "zeroing in on what makes the workplace so ridiculous." Although Adams makes fun of corporate bureaucracy, may corporations have invited him to speak at their conventions.